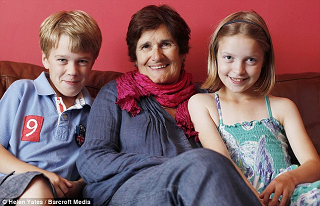 October 5, 2012 - Janet Maslin-Bosher’s twins turned ten a fortnight ago and the celebrations were predictably lively. She bought them matching scooters, chased along beside them as they rode them, prepared a birthday tea and took them to the theatre. The festivities would have taxed the most youthful of parents — but at 68, Janet was exhausted. The children are my life and of course I wouldn't be without them. But 58 is old to become a mum. There should be a cut-off age for IVF treatment and 50 is sensible, she says. -- Today the number of women having their first child over thirty-five has increased by a bazillion fold, or some equally scary large number, and Newman is the first to write a book that tells what it's really like when a trip to the drugstore entails the purchase of both diaper cream and wrinkle cream; when getting your shots means both immunization and Botox. You Make Me Feel Like an Unnatural Woman is not only about having children later in life: it's about what happens to a marriage—and to the spirit, when even the most sought-after baby comes. Wry, warm, and brutally honest, this is the book for any woman—whatever her age—who has awakened at 3AM to the insistent shrieks of her darling and thought: Oh man, I'm too old for this.